Kodaikanal is the beautiful hill station of southern India encompassed in the upper Palani hills neighboring the valleys of Gundar and Parappar. It is adorned with a serene man made lake in the heart of the city, covering a circular area of around five km. The beauty of Kodaikanal is augmented with the splendid meadows and grasslands, which is supposed to be the identity of this hill station. Among the many captivating attractions of this hill destination Silver Cascade Falls attract both the leisure and the adventure tourists. Kodaikanal can be accessed from the nearest railheads at Kodai Road and Palani railway station which are the entry points to the exclusive Kodai town. Madurai and Coimbatore are the nearest airports to this hill station. It can also be accessed by road from Theni, Dindigul, Bangalore, Kumili and Coimbatore. Kodai Lake located at the center of the city is a manmade lake converted from a marshy area, offering exclusive views of the surroundings. The excess water of this lake takes a turn and jumps over a vertical cliff near the Ghat road which is popular as Silver cascade falls. 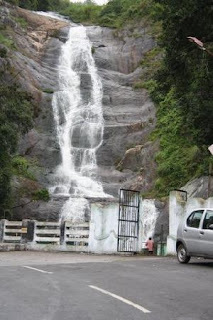 Silver Cascade waterfalls the secret and prime attraction of Kodaikanal is revealed to the tourists while coming from Madurai to Kodaikanal. This beautiful collection of scenic falls is located just eight km from the city. Most of the vehicles passing through this point take a halt at this location to catch some exclusive views of the surroundings. The view of the crystal clear water rolling down from a height of around two hundred feet down the slopes sidelined by piles of huge rocks, offers a mesmerizing experience to the visitors. Silver cascade preserves its identity with the cleanliness of its water, which is supposed to be rich in minerals and taking a bath in these falls offers a rejuvenating experience. With the rising popularity of these falls many kodaikanal resorts and hotels have shifted near these waterfalls. While visiting this splendid hill station of Tamilnadu you can take shelter in one of the accommodation types available in and around Kodaikanal. We provide spacious well furnished luxury accommodations at our United-21 budget Resort in Kodaikanal. These rooms are adorned with all modern facilities and amenities to make your stay more comfortable and memorable.